Although this collection is inspired by the poet’s childhood on a Pennsylvania goat farm, it has nothing to do with hypnotizing goats. 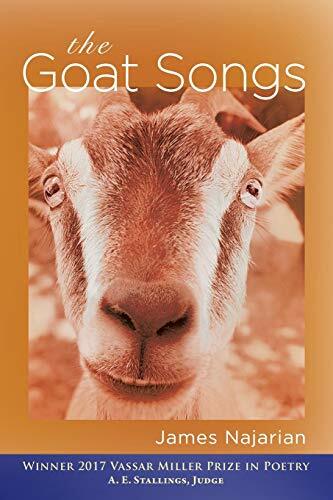 In fact, the stark images of goat biology, behavior, and disease engage the reader so much that we experience humor, irony, and sorrow—real human emotions—while reading the poet’s elegant and precise writing. It is anything but farcical. The publisher ought to redesign the cover to encourage and inspire, rather than risk comic misinterpretation of the graceful, evocative, and serious content. Now open the book. Divided into three sections, there is a careful autobiographical progression from childhood through adulthood, complete with reflections on the poet’s Armenian family history, with each section composed of the poet’s memories. That is the genesis of almost all poetry: reflections on past images. Here are some from “First Kidding”: “When it is time, your doe will heave herself / and murmur to an absence felt behind her.” Take note of the words “your doe” here. The author embodies the doe in this poem, takes possession of it, and uses the birth of its kid as a metaphor for human birth, implying the birth of the poet and his connection to the farm. This metaphor is reinforced by the first two lines of the third stanza: “Here is the ancient scent of fruit and wet; / it is where you come from…” These lines instill the all-too-crucial sense of place in the poem, the clear place of birth from within a goat’s voluptuous womb. The strong sense of place continues in the poem, “To the Fields”. Observe the first stanza: “On the oldest maps, a township lane. / On the topographical, a set of dashes. / The road climbs the ridge behind our farm . . .” The poet uses clear mapping images here to outline the poem’s landscape, also defined in the third stanza, “This road traverses my own history:” What history? That is exactly what the book is about, experiencing a unique life history in bountiful, clearly defined, landscapes, from Pennsylvania to Armenia, to learn how a diverse, multicultural background empowers one’s self. Another favorite is “Famous Painting,” in which the poet describes a painting at the Yale University Art Gallery. The poet is not afraid to criticize the painting, writing the following on the first line: “This is Outrageous. There is nothing here.” The poet goes on to describe pedestrian images until the turn in the poem, in the third stanza, in which the poet dares the reader to question where they might be if they sailed into the horizon presented: “ . . . Iceland or Portugal, / Madagascar, Zanzibar, or merely // Long Island. Or somewhere we will never be. / Here then. Taste some of the sea.” The poet offers salvation, a new view of a mundane work of art; he offers a sense of wonder and desire, a desire to seek out and harness emotional satisfaction from something inane. “Halcyon Days” is an anomaly. It doesn’t quite fit with the tenor of the collection. It is about drug use and utilizes a list of drugs (Seroquel, Abilify, Xanax, etc. ), weaved into the poet’s daily activities, to create a metaphor for depression, and how we overuse drugs to compensate. The landscape here is not nature or farmland, but rather the poet’s own body. It seems as though this poem would work best in a confessional poetry collection, rather than one derived from nature. Also of note is the interlocking end-rhyme scheme; it creates a sense of whimsy and nonchalance, to mimic the effect of the drugs. The combination on container and content constitute a successful poem. Most contemporary poets avoid metrical and rhyming poetry, as they consider it antiquated and constrictive; however, Najarian takes a risk, breaks with conformity, and succeeds. The Goat Songs is new. It is an inspired collection rooted in cultural heritage, introspection, and nature. It offers cultural history and identity, all stemming from a unique childhood on a goat farm, a farm which proves that life can be absurd, yet always fulfilling.